The symmetry, speed and bandwidth of your connection function jointly to deliver an ideal user experience. While traditional networks offer high-speed connections, cable and DSL are typically asymmetrical and deliver uneven upload and download speeds—with upload speeds being a mere fraction of the download speeds. However, upload speeds are becoming increasingly critical to business operations as more companies implement cloud-based services and applications. “Symmetry,” when used in relation to connectivity, refers to data speeds that are the same in both directions. 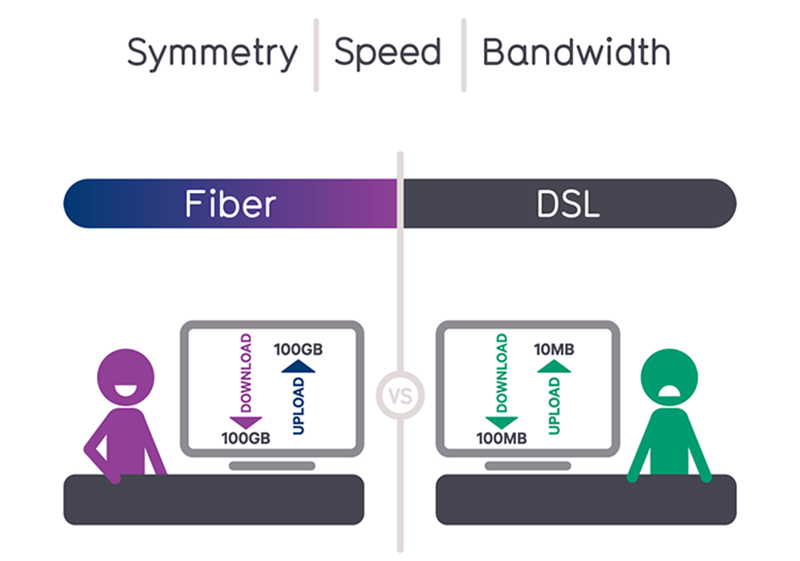 Because fiber is symmetrical in nature, it provides users the same bandwidth for both downloading and uploading—eliminating the inconsistencies that come with the competition. Fiber-based networks also are more robust than traditional broadband networks. While cable has a maximum speed of hundreds of Megabits per second, high-speed fiber networks can reach more than 100 Gigabits per second—equivalent to 100,000 Mbps. Fiber offers users a bandwidth pipe with a high capacity for internet traffic, data transfer and more. When deadlines are looming, fiber customers can be confident uploading large files or transferring data rather than contend with pixelated videos and dropped calls.